One of the most remarkable differences between Los Angeles and Austin, Texas is the cost of food. I was floored when I first saw prices on the menus, and some of my favorite places offer sustainable cuisines at prices I can sustain on a budget. One of my favorite crowd-pleasing restaurants in Austin in Kerbey Lane Cafe. Not only do they offer fresh, locally-grown food, but they have everything from hamburgers to vegan pancakes. It's amazing, because it's hard to go wrong bringing family and friends to Kerbey Lane. Kerbey Lane is one of my favorite restaurants due to their large menu and affordable prices. 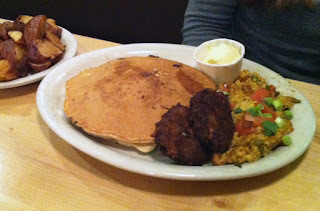 They won me over as a vegan for having a daily vegan pancake special, including vegan pumpkin pancakes seasonally. The platter includes soysage, tofu scramble, two pancakes, and vegan "butter." The restaurant even has a vegan menu in case you have any questions or are looking to try something new. They also cater to other special diets, such as gluten-free. Those on a budget can use the Go Local card for more savings during weekdays. Another benefit to Kerbey Lane is the availability. With five locations and 24 hour service, Kerbey is an easy choice for those times when you don't know where to eat or are looking for somewhere that won't close at 9 pm. Overall, I really enjoy eating at Kerbey Lane and I'm sure I'll be back again soon. Disclosure notice: This restaurant was reviewed at the discretion of the reviewer. No compensation was accepted and the opinions are my own. Please verify any claims with the restaurant, especially if you have any allergies or concerns.